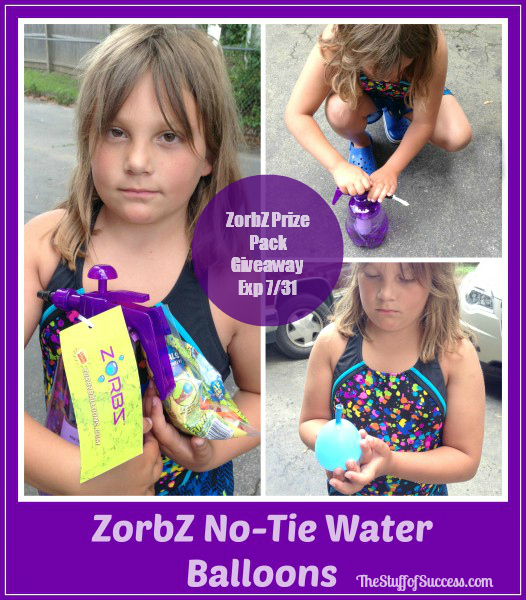 ZorbZ has these self sealing, no-tie water balloons that are totally awesome. Zorbz is an introductory product for Hydro Toys which will eventually have many more products to solve existing consumer problems. Zorbz balloons are made from premium GoodYear latex rubber and have a custom patented balloon shape creating a higher performing balloon. See the full review at The Stuff of Success. And right now Zorbz is offering a fantastic prize pack for a lucky TSOS or Tales From A Southern Mom reader. The prize package includes: (1) 100 ct. balloons, (1) filler bottle, (1) plush beach towel, (1) bottle sunscreen and (1) waterproof beach tote and is open to entrants age 18 and older and US residents. Disclosure: The prize sponsor will send prize to the winner. This blog is not responsible for prize. If you have any question please send an email to thestuffofsuccess@gmail.com. All entries are optional, if you do any of the tasks you can collect the entries.